Hello! 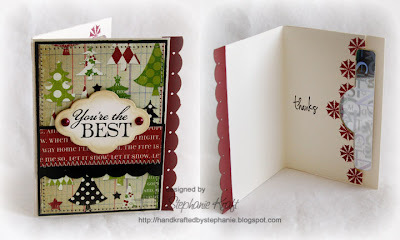 I'm back with my final two projects for Verve's Blog PaRtY. First is the Mini Pizza Box challenge by Susan and Jen del Muro. 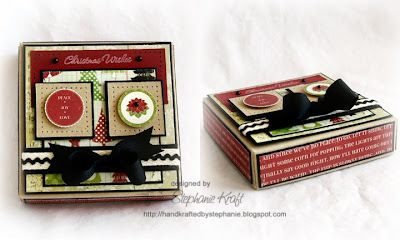 The challenge was to make a Mini Pizza Box (see Jen's tutorial here). I also used Jen's Sketch For You To Try (11/28/09) for my box top layout. I've been wanting to make one of these for awhile now -- they are super fast and fun to make. Box is 4" x 4" x 1". It is the perfect size for a set of little notecards, small gift items or even a gift card -- the possibilities are endless! Speaking of gift cards, for the final challenge Jen Tapler and Sankari challenged us to make a gift card holder. I used these instructions for a pop up gift card holder, but I wanted it to lay flat and be like a card with a pocket, so I adhered it so it wouldn't pop up. I used some of the same patterned paper as I did on my pizza box (from Making Memories) and inserted a shiny Nordstrom's gift card -- now who wouldn't like that?!? Accessories: 1" circle punch (EK Success), Black pearls (Kaisercraft), Ribbon, Paper piercer, Foam tape, Red line tape. Accessories: Labels Six Nestabilities (Spellbinders), Scallop Diamond border punch, Circle punch (EK Success), Word Window punch (SU! ), Pearls (Prima), Foam tape, Red line tape, Thread, Sewing machine. This set is just darling. I love the gift card holder. This is great, I checked out the tutorial and it is so simple - must give it a go. Love the design on the front too. Awesome pizza box and cards! I've never made a pizza box....but I need to!